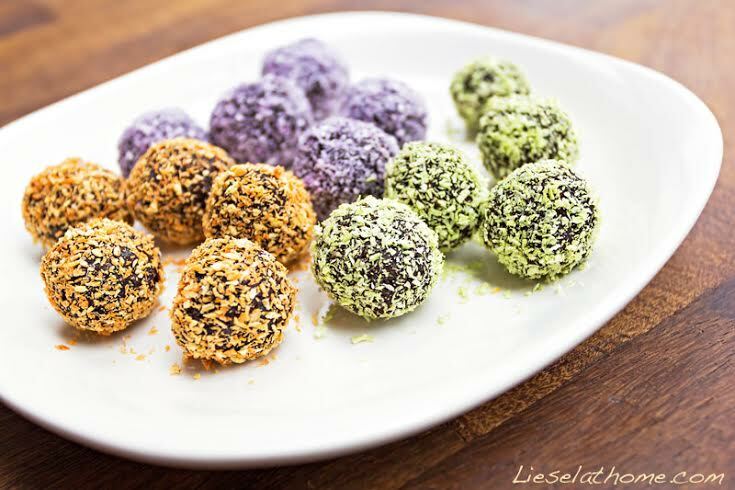 You need 150 ml (0.6 cup) shredded coconut for this, and preferably rather dry shredded coconut. I buy a good quality, but “milk” mine first, meaning; mixing with water, draining it to get coconut milk, and then drying the left over shredded coconut. But if you don’t want to make your own coconut milk you can just buy cheap shredded coconut. 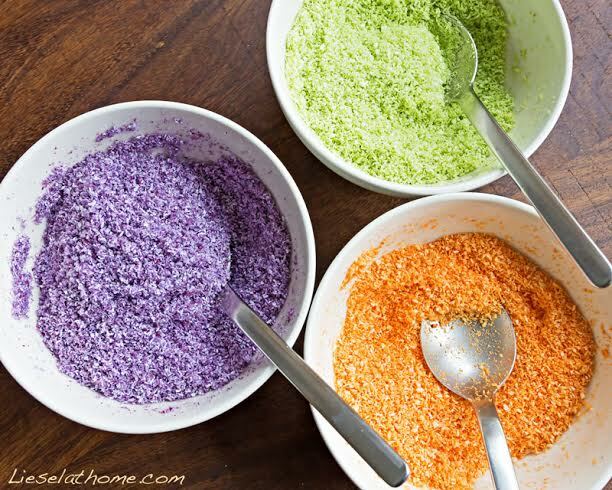 This kind is mostly rather dry and tasteless, which is perfect for making colorful coconut sprinkles! For pink – use beetroot juice. Fresh home pressed is of course awesome but store bought will do too. For purple – mash a handful of (real) blueberries and strain the juice. Cheap, cultivated blueberries do not have this color. I recommend the organic frozen blueberries from Naturata. For green – spinach. Either make spinach juice if you have a juicer, or take frozen spinach – 4 small blocks – and a few tbsp. boiling water. Mix in a blender until sloshy green. Then drain through a tea strainer to get the green fluid without the spinach pieces. And finally orange: Although I am aware of how expensive saffron is, when coloring, you can get away with using the cheaper kind of saffron. And also – you need very little saffron so even if you can’t find the cheap kind it might still be worth it. Just add a few strains of saffron to 2 tbsp. hot water. Just enough to give a strong yellow color. Stir 2 tbsp. of colored fluid into the shredded coconut and mix well. Spread out on a baking tray or similar and let dry in open air. (Don’t put it in the oven – heat will make the color fade!) Once completely dry (takes between an hour and up to a whole day depending on where you place it) store in jars with tight lids. 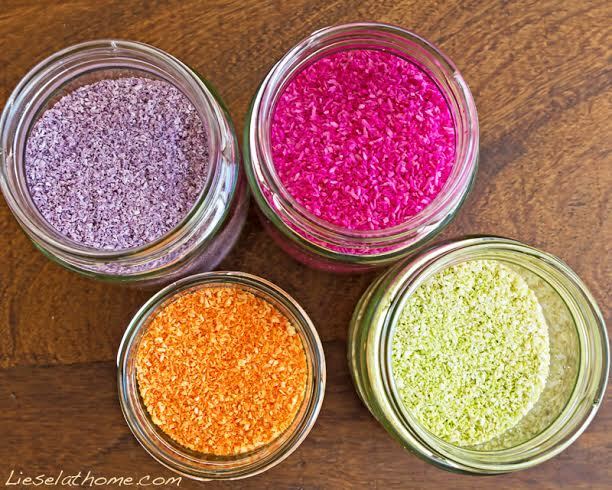 Sprinkle generously over, cakes, cupcakes, desserts, yogurt, chia pudding or anything else that needs a bit of color! I use shredded coconut as a base for these sprinkles – but who says you can’t experiment and use other food, like white sesame seeds or sliced almonds? 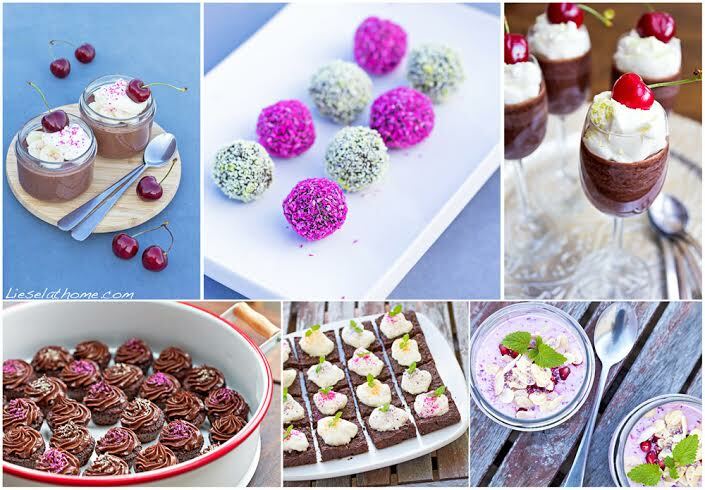 Using the same “colors” you can also color crème fraiche or mascarpone – or even whipped cream. Look around your kitchen – maybe you will come up with more ideas on what to use making other colors too. « Go Gaelic in Luxembourg!